In this lively survey of women as history-makers, Sue Armitage explores the story of women's lives from the earliest inhabitants to yesterday's newest migrants, told within the larger framework of the changing Pacific Northwest -- Washington, Oregon, Idaho, western Montana, and British Columbia. Showcasing both the variety and commonality of women's activities and values, Armitage provides an ongoing context for women's lives and shows how their activism on behalf of families and communities has made our regional history. 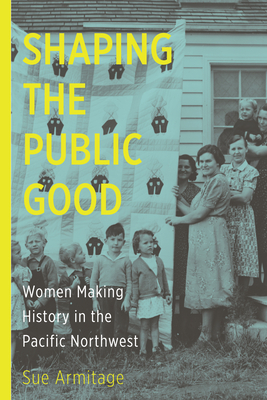 Shaping the Public Good's narrative encompasses women of all races and ethnicities -- the famous, the forgotten, and the women in between -- and provides an accessible introduction for general readers and scholars alike. "This history of the Pacific Northwest is written with a clarity that never over-simplifies the complex, and a fair-mindedness, a sense of justice, that is very rare. Nothing I've ever read about the region and its peoples has ever offered so true a perspective on it -- or been so unflaggingly interesting." "Be forewarned if you've succumbed to the myth that it was he-men who developed the Pacific Northwest. Now the trappers, loggers, miners, cattlemen, and railroad builders must make room for the many women, of every race and ethnicity, who contributed. Armitage puts faces on the interpreters, homesteaders, journalists, lobbyists, activists, schoolteachers, and Rosie the Riveters who populated the region." "This is a deft and masterful incorporation of a thousand facts into a polished, readable, and necessary story not just about women's history, but the history of everyone who lives in the Northwest." "Armitage has made a long-lasting and significant contribution to our knowledge, but more importantly she has provided an outline for future work and modeled an approach to women's history that provides a roadmap for that work." "In her introduction, Armitage states that the book's major task is "to show how and why women have made - and are still making - the history of the Greater Northwest." She has accomplished that in graceful and inviting prose, in thoughtful analysis, and in compelling stories. Shaping the Public Good also reminds us that Armitage, too, has made history over the course of a career that has refocused the lens through which we now see western history."